1.1 Celebrate, netizens! 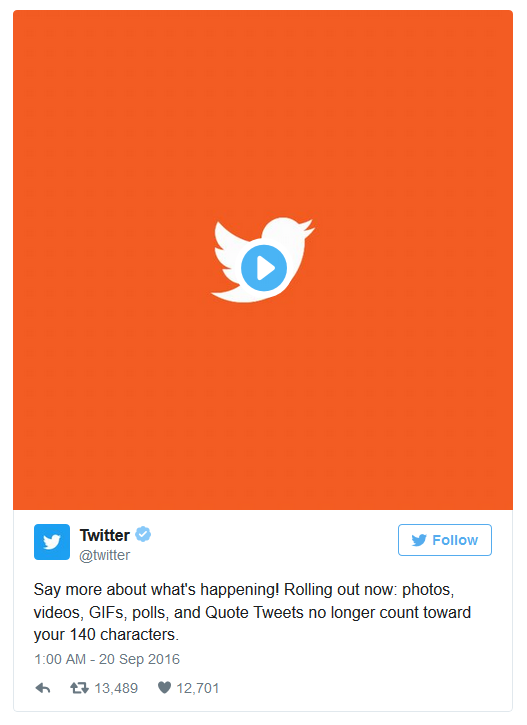 Twitter now updates exceptions for pics, GIFs, vids, polls, quote tweets. Now, you’re 140 character limit will just count actual texts. Celebrate, netizens! Twitter now updates exceptions for pics, GIFs, vids, polls, quote tweets. Now, you’re 140 character limit will just count actual texts. Using Twitter? Well, you can attest to the fact that the 140 character is just a minuscule space to express your thoughts or share your favorite social media posts. Now, Twitter gives an update to squeeze in a little bit of slack to this short character counts. It still has 140 character count but it won’t be eaten up by pictures, GIFs, videos, polls and quote tweets. These are the links to outside material posted and shared on your Twitter posts. Prior to today, any media loaded onto a tweet would be linked to its own page and that link would be pasted in the tweet. No matter how long an URL actually was, it counted for 23 characters (plus a space) on the tweet. Now, whether it be a poll, a picture, a video or even a Quote Tweet (those were also linked), nothing will take away from your 140 limit. Just plain ‘ol URLs and @name mentions. Those may soon also go away. The current batch of exceptions, announced in May, is rolling out today.